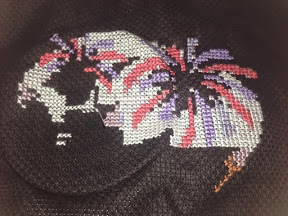 StitchyDonDesigns: Some Firework Progress !!!! Thanks, it's a nice little project to work on when I only have a little bit of time. I am a pretty good finisher as I always want to get to the next project haha. When I step back, it does look good but I'm not that keen on the fabric although it does work for this project !!! Aww I think it looks great! I love how colours pop on black fabric. The colours do look good on it, as soon as I saw the project I knew I wanted to do it on black fabric. It's just a bit of a pain haha.